Special attention is given to nitrogen and phosphorus compounds which cause the growth of cyanobacteria and microalgae in lakes, rivers and the sea (eutrophica-tion; see Chapter 10). The main dissolved components and their concentrations in municipal wastewater are presented in Table 2.3. Table 2.3 Typical content of dissolved nitrogen and phosphorus compounds in municipal wastewater (in mg L_1; Henze et al. 2002). 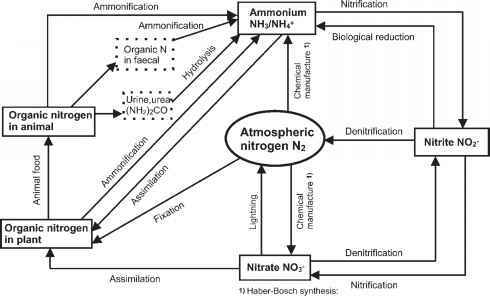 Dissolved NH3 + NH4 values for industry and agriculture are given in Table 2.4 (Dombrowski et al. 1989). These concentrations are considerably higher than those for municipal wastewater, resulting in more difficult processing and higher costs. Higher phosphorus concentrations are observed most frequently in effluents of the fertilizer industry, with up to SPO4 = 50 mg L-1 P.
Table 2.4 Typical content of nitrogen (NH3-N + NH4-N) in wastewater from industry and agriculture (Dombrowski et al. 1989).